Security and economic challenges that will face the U.S. in 2020 will primarily be in the Pacific Ocean region, the chairman of the Joint Chiefs of Staff said Tuesday. 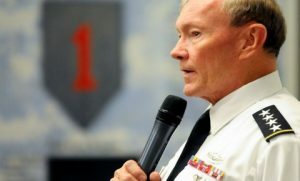 According to American Forces Press Service, Army Gen. Martin Dempsey said in Germany the country’s shift of focus to the Asia-Pacific region is an effort to align the military instrument of power with other instruments. That effort is also about rebalancing intellectual energy and how the U.S. applies it, Dempsey said, according to Jim Garamone’s story. An official speaking on background told AFPS multilateral efforts were discussed at a recent Association of Southeast Asian Nations meeting in Indonesia, adding the U.S. wants to see more of those efforts and is interested in seeing ASEAN as a more proactive problem solving body.